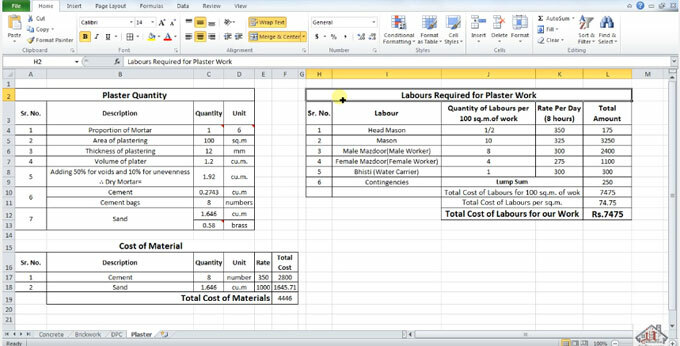 In this construction video tutorial, one can learn the detailed process through excel for estimating the quantity of labor necessary for plaster work. Here, a table is created in excel that contains the quantity of labor per 100 square meter of work as well as rate of labor each day for 8 hours. Besides, the table contains the lists of different types of labors like head mason, mason, male worker, female worker water carriers as well as contingencies. The rates of these labors for 8 hours are also provided. These information are collected from a standard DSR book. Plastering work involves proportion of mortar, area of plastering, thickness of plastering, volume of plaster, 50% for voids, 10% of unevenness, cement and cement bags required for dry mortar, cost of material for cement and sand.